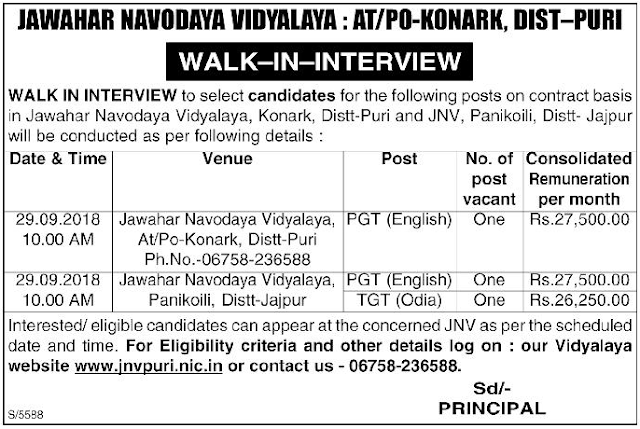 Jawahar Navodaya Vidyalaya, Puri has advertised in the SAMAJA newspaper for the recruitment of Teachers TGT / PGT jobs vacancies. Interested and eligible job aspirants are requested to walk-in on 29th September 2018. Check out further more details below. About School: The Navodaya Vidyalaya System is a unique experiment unparalleled in the annals of school education in India and elsewhere. Its significance lies in the selection of talented rural children as the target group and the attempt to provide them with quality education comparable to the best in a residential school system. Such children are found in all sections of society, and in all areas including the most backward. But, so far, good quality education has been available only to well-to-do sections of society, and the poor have been left out. How to Apply: Interested and eligible candidates are requested to attend the Walk-in interview along with CV, originals & xerox copies of certificates and PP size photos to the following walk-in address.